‘Some days I pick up a camera and the lens is my ink, for cameras have sensor eyes, and pixels record. I slide it into a pocket, a thin point-and-shoot, and find another way to chronicle, to force the lids open; another way to receive the moment with thanks reverential. 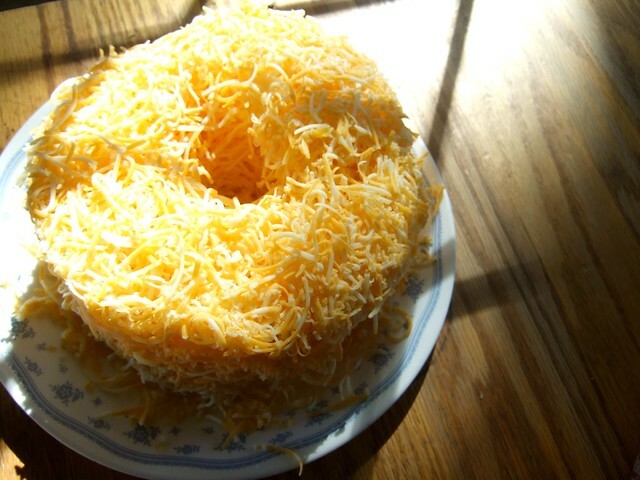 When he comes in from the barn, The Farmer Husband finds me with my hammer in hand, leaning over a plate of cheese grated and sitting in sunlight. It is true. I do feel foolish. 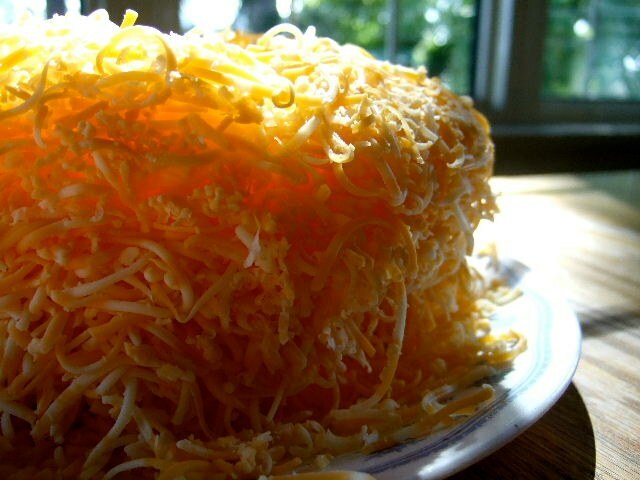 I mean, it’s curls of mozzarella and cheddar piled high in a pond of golden day. And I’m changing the settings for to macro, increasing the ISO, pulling in for a close-up frame. He’s fed 650 sows with one strong arm this morning, flicked on a welder and melded the steel. 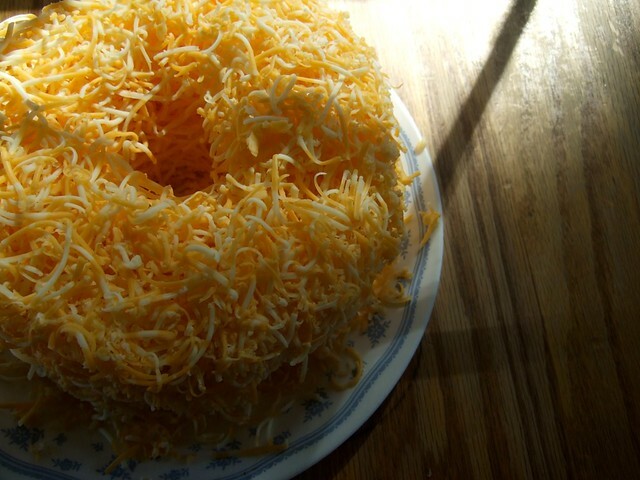 It is quite possible that the God-glory of a ring of shredded cheese may be lost on him. “I like finding you just like this.” He wraps one arm around my bowed middle, draws me close and up into him strong. “Crazy like this?” I blush silliness, and he brushes close with the four-day stubble. He laughs. Happy in all these little things that God gives. Ridiculously happy over slips of cheese. That I am, and it’s wild, and, oh, I am the one who laughs. Me! Changed! Surprised by joy! The brave who focus on all things good and all things beautiful, who give thanks for it and discover joy even in the here and now, they are the change agents who bring fullest Light to all the world. This thanks for the minute, it is to say the prayer of the most blessed of women about to participate in one of the most transformative events the world has ever known. Mary, with embryonic God Himself filling her womb, exalts in quiet ways: “My soul doth magnify the Lord” (Luke 1:46 KJV)…. And when I do this, give thanks for the seemingly microscopic, I make a place for God to grow within me. This, this, makes me full. I “magnify him with thanksgiving” (Psalm 69:30 KJV), and God enters the world. What will a life magnify? The world’s stress cracks, the grubbiness of a day, all that is wholly wrong and terribly busted? And what you are all doing over at onethousandgifts.com Look at all you over there! Wonder! You are all looking for His glory and grace and your are the change agents bringing fullest Light to all the world! Grace — you choosing to make your lives about magnifying your Lord in all things…. The ripples continue to spread. Your example of counting blessings now has our home filled with the list-makers. And as we change, the excitement in our hearts naturally testifies to many around us. The Lord has opened so many doors for us to share your testimony by giving away copy after copy of your book. And the responses?? Oh my!! More blessings! And the cycle repeats as those to whom we have given books, give books. So precious. So “thank you, thank you, thank you” for being the start of the ripples. May they continue until they wash over many, many more hearts, awakening them to live fully right where they are. Oh how we wish to magnify the Light and rest in the beauty of all things–good, bad, great or small. What an example in doing just that. Loving the book and the life lessons it brings. I loved chapter 3 and 4. They are all marked up from my underlining. Oh, these pictures make me so happy! I so wanted to see the pictures you mentioned in the book. Thank you for sharing! I’ve started my own list of 1,000. I was telling my sister-in-law about it, how even the things that normally would be draining and frustrating I’m seeing as gifts. She said, “you’re learning to see the other side of things.” Thank you for showing us the other side of things. Slowing down to see the minute, embracing the details, swallowing particles … learning to see, closely leaning in on my Father’s shoulder to hear what He hears, gently touching the tiny … He is teaching this one to be still, to know that He is God and He is everything, in all the details. He is not only the sky and the mountains, but in one snowflake that falls from that sky onto that mountain. He is right where I am. He knows every cell of my body and counts them each precious as they provide the workings of this body-temple. I am learning. I am learning. “From this TIME forth and forever.” His time is endlessly alive and I am in this moment with Him. He surrounds me as the mountains surround Jerusalem. He encapsulates me in this minutiae and I am learning to see, hear, love it. Thank you, Ann. I am so hungry to grasp this grace from God, my Father. And He has His hands out so eager and ready to give it to me. I just am learning, learning, learning. Your words and sharing with the ladies here is so special for me right now. I find that the repetitive yet changing structure of your words, your sentences, keeps me in the midst of these thoughts, the eucharisteo, the grace, the walk. Thank you for, not only allowing God to use you to write this book, but to be the teacher to us. God has given you a beautifully grafted gift from the Vine of Christ. So THAT’s the cheese from ch. 4! I searched all over your blog and couldn’t find it. So glad you posted it here. You’re right; it IS beautiful! My nickname by my grandmother growing up with JOY. It seemed to consume me and surround me. In the past two years, the devil has tried….and almost succeeded….in robbing me of this gift from my Father. Thank you for your precious reminder of HIS daily little gifts that RESTORE one of His best gifts to me! I was so encouraged and had some amazing “aha!” moments reading chapters 3 and 4…especially 4. Thank you Ann for sharing! God is using this in my life and I can’t wait to see what He’s going to do!